135 Great Plain Avenue is a unique parcel of land in Wellesley that may not be known to many by its address, but that all residents have probably driven past on their way to the Town RDF or the Boston Sports Club across the street. 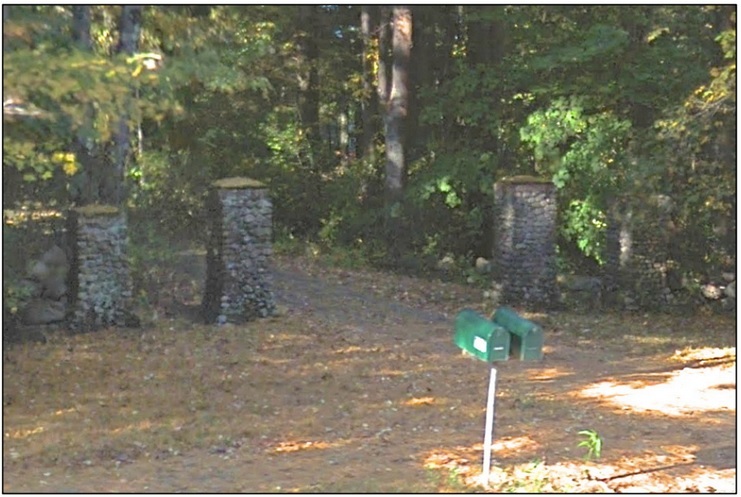 To the careful observer, the driveway entrance is known by its stone gates on Great Plain Ave. In late 2014, following almost 300 years of private ownership, traceable to the prominent Fuller family of Wellesley, the approx. 12 acre parcel was sold to Burlington-based developer Northland Residential Corporation. Around the time the property came under agreement for purchase and sale, the Wellesley Historical Commission wrote a letter to both the Planning Board and Natural Resources Commission, copying the developer, in which we provided targeted preservation recommendations and outlined our concerns regarding the historical aspects of the property in connection with the requirements of the Town’s Natural Resource Protection Development bylaw (the NRPD Bylaw), which will govern the proposed subdivision of the property. The subdivision of 135 Great Plain Ave. will be the first application of the NRPD Bylaw. In 2015, the developer submitted its proposed Definitive Subdivision Application for 135 Great Plain Avenue to the Planning Board. After reviewing the plan, the Historical Commission wrote a public comment letter to the Planning Board, in which we applied the NRPD Bylaw to the plan and outlined our substantive, legal concerns with the proposed subdivision plan. On September 8, 2015, representatives of the Historical Commission attended the first public hearing on the plan before the Planning Board, at which the developer presented its plan, abutters and other members of the public spoke, and a representative of the Historical Commission briefly addressed the Planning Board concerning our comment letter. The Plan Fails to Demonstrate a Context-Sensitive Design, Particularly with Respect to the Natural Setting and Topography of the Property. The intent of the NRPD Bylaw is to allow innovative, context sensitive design of large subdivisions. In furthering this intent, the NRPD Bylaw requires minimizing the destruction of, and encouraging the permanent preservation of historical, cultural and scenic areas, as well as promoting development that consumes less open land and confirms to existing topography and natural features. Various design requirements apply to subdivisions governed by the NRPD Bylaw, including that landscape shall be preserved in its natural state, insofar as practical, by minimizing tree and soil removal and the removal or disruption of historic, traditional or significant uses, structures or architectural elements. The developer’s proposed subdivision plan, a simple lollipop design, shows little — if any — creativity within the context of the property’s natural setting, contrary to the express purpose of the NRPD Bylaw. Further, rather than conforming to the natural, wooded existing topography of the land, the plan calls for the entire subdivision area to be significantly clear cut, bulldozed and regraded, again running contrary to the plain language of the NRPD Bylaw. The Plan Fails to “Minimize Insofar as Practicable” the Removal or Disruption of Historic Structures. The plan currently proposes that the main house located at 135 Great Plain Ave., built in 1905, be demolished. Based on the factors indicated in our comment letter, the Historical Commission has determined that the house is historically-significant to the Town. As noted above, the removal or disruption of historic, traditional or significant uses, structures or architectural elements shall be minimized insofar as practicable. It is insufficient as a matter of law to interpret the phrase “insofar as practicable” as having been satisfied upon a mere showing that retaining the 1905 house as part of an NRDP-governed subdivision is inconvenient, or even that retaining the 1905 house will require the developer to incur an additional expense. The relevant legal inquiry is instead whether any solution to protect the 1905 house is unfeasible, and arguably whether any such solution would render any development of the property — not merely the specific development scheme that the developer may ideally prefer — uneconomic. The Historical Commission has seen no evidence that this would be the case. For a detailed analysis of our concerns with the current version of the proposed subdivision plan, please review our comment letter. Please watch the Town’s calendar for upcoming hearings, all of which are open to the public should you wish to provide comments on the subdivision.